2. 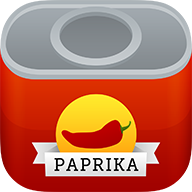 Log in with your Paprika Cloud Sync account. 3. Copy the bookmarklet script onto your clipboard. To do this, tap and hold over the script until the blue selection handles appear, and then drag the selection handles until the entire script is selected. Then press Copy. 4. Tap the Share icon in the toolbar, and select Bookmark. 5. Without making any changes, press Save. 6. Now, tap on the Bookmarks icon, and find the bookmark you just added. Press the Edit button in the lower corner and select the bookmark. 7. Highlight the URL shown in the bookmark, and press Select All. 8. Replace the current URL by pressing Paste. This will paste the copied script into the bookmark. 9. Optionally, you can change the name of the bookmark from Paprika Bookmarklet to something more descriptive, such as Save Recipe. 10. Now you are done. Whenever you browse to a recipe you would like to save, you can tap on the bookmarklet in order to save the recipe.